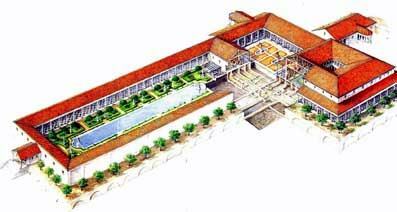 A reconstruction of Pisos 1st-centruy-BC palatial villa at Herculaneum (above) and the excavation (left). The colonnade with sweeping views of the Bay of Naples was 250 yards long. Sadly, the sea has receded by a few hundred yards. Many rich Romans chose relax in this seaside resort. Piso was Julius Caesars father-in-law. His philosopher in residence, Philodemus, who was Virgils tutor, gave a high tone to discussions with distinguished guests. John Paul Getty was fascinated by this building and based his Malibu art gallery on it.